Career Fair Launch, a photo by Anita Borg Institute on Flickr. 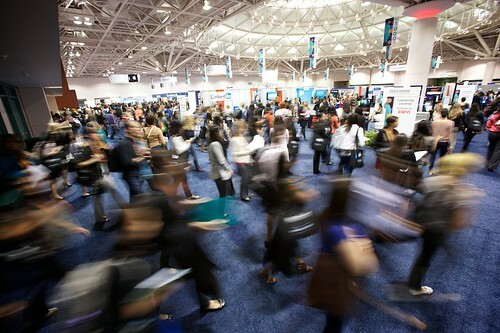 If you are planning to attend a career fair, read this checklist posted on Military.com, "Five Things to Take to the Career Fair." If you are considering graduate school, think about the factors explained in this article by the Devex International to determine whether the time is right for graduate school. You want to determine if the return on your investment will really be worth the extra student loans and time off work. Try a career or graduate planning workshop through MIT’s Global Education & Career Development Center. Workshops range from business etiquette, resume writing, negotiating salary offers; considering graduate school; and a lot more! Also...visit my Career Advice Corner on Pinterest.